Lemon juice is probably the easiest cleaning and care product to produce at home – simply grow a tree and squeeze! 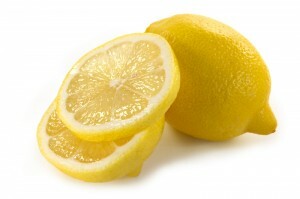 Lemon juice is very useful and not nearly as expensive as commercial cleaning products, many of which contain it. It has a wonderful and therapeutic aroma, so cleaning with it makes your home smell fresh and keeps your spirits lifted. It is often an interchangeable cleaning ingredient to vinegar, so use whichever you prefer or have access to, but there are some applications where it is definitely superior. (You can also use a little lemon juice with vinegar to neutralise the vinegar smell while you clean.) It is good for your skin and circulation but will of course sting (and disinfect) any open wound. The juice of lemons consists of a solution of water and various dissolved substances, the most important of which are acids. 90% of these acids, or about 5 or 6% of the lemon, is citric acid (C6H8O7). This gives lemon juice its sour taste and makes it a cheap and easily obtainable natural acid. Lemon juice also contains sugars and other molecules and its specific makeup will vary according to the lemons’ species, age etc. Citric acid is an excellent benign cleaning and disinfecting agent, and is also used in the metabolism of most living things. Lemon juice is simply the liquid squeezed from lemons. India, followed by Mexico, Argentina, Brazil and Spain, produce the most lemon juice. But anyone can grow a tree and produce their own! To get the most juice out when you squeeze a lemon, it should be at room temperature or slightly warm. To select a juicy lemon, pick one that is yellow without tinges of green, heavy for its size, and with a fine grained skin (this tends to mean a lower skin to flesh ratio). Roll it in your hands to slightly warm and soften it before squeezing, or prick it and warm in the microwave for a few seconds. Lemon juice is used in food and drinks for its delicious flavour, as a marinade, tenderiser and short-term preservative against oxidization. Lemon juice is a powerful antibacterial – its acidity breaks down the bacterial cell membrane. The Romans used lemon juice as an antidote to several poisons, and it is now believed to be anti-carcinogenic. It has very high levels of vitamin C and has been famously used to treat and prevent scurvy in sailors. It also helps combat colds, sore throats, and gum disease. Although it is acid, it becomes alkaline when digested by the body and helps aid digestion, fight urine infections, arthritis and rheumatism, and flush out toxins. Lemon juice is refreshing and helps the body to maintain a healthy temperature, so it is good to add to water as a drink in hot weather or to help reduce a fever. The wonderful uplifting aroma of lemons makes it a pleasure to use. It combats depression, increases energy and induces calm and focus. It is a powerful solvent (which can be seen by the fact that citric acid is used in industry to dissolve rust from steel) and degreaser, giving it many household cleaning uses. It is also very good for the skin and has a number of uses for personal care. It is not known where the lemon originates, but it is presumed to come from India, Burma and China. It was well known in that region as an antiseptic and poison antidote from ancient times, and had come to Europe by the first century AD. By AD 700 it had reached Egypt, where it was also used in embalming. The Greeks used its insect repelling property to keep clothes moths away from (and to scent) linen, and grew it close to olives for parasite protection. Lemons only began to be used for cooking and flavouring much later, in the 1700s, and soon after to treat scurvy.